This week's challenge on CD Sunday is 'Teddy Bears'. I have used Docraft Forever Friends CD to create this card. This is a pretty image Colleen and I love those corners. Thank you for your continued support at CD Sunday. I love FFs - great card. Thanks for joining us at CD Sunday. A favorite bear for most of i think, great image with a touch of sparkle. Thanks for joining us at CD Sunday Colleen. A beautiful Anniversary Card Colleen and two lovely bears. Love the corners. 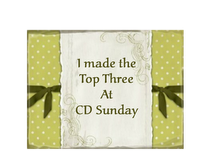 Thanks for your continued support of us at CD Sunday. A lovely card Colleen. Those FF bears are so cute. Perfect image for an anniversary, thanks for sharing your creation with us at CD Sunday.